Dionysus Records is proud to release on a limited vinyl pressing, Istanbul, Turkey’s REPLiKAS’ first American album (their sixth Turkish release) Biz Burada Yok Iken. 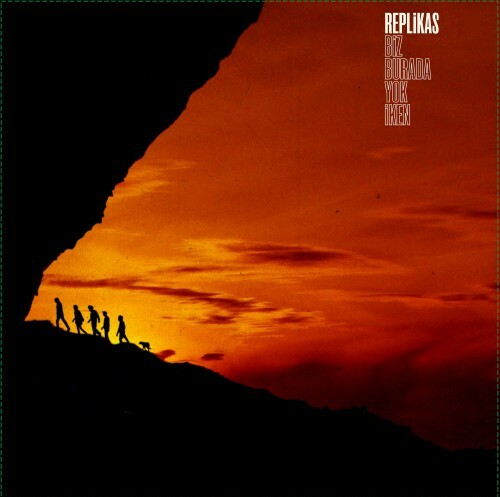 REPLiKAS’ Biz Burada Yok İken consists of classic Turkish psychedelic and garage cover tunes from the 1965-75 Anatolian Pop period. It is the definitive salute to their linage with extremely powerful covers of songs by Mavi Iskilar, Erin Koray, Mogollar and others. The LP is pressed on thick vinyl, and comes with an insert fully annotated with background information on each track and its’ original artist and release – illustrated with pictures of the original record sleeves. Biz Burada Yok Iken is distributed by ILD, request it at your favorite record shop or purchase here from Dionysus mail-order. Replikas – Kaleden Kaleye Sahin Ucurdum from replikas on Vimeo. REPLiIKAS debut album Köledoyuran (2000) and second album Dadaruhi (2002) were released by the Ada Music label. The band’s third album, Avaz, was produced by Wharton Tiers and released in May 2005 by the Doublemoon label. The band recorded their fifth album, Zerre, in a former prison located in the Gökçeada Island, which they converted to a studio. Peyote Music released this album in November 2008. Alongside releasing albums and playing concerts, REPLiKAS also writes music for films. In 2001 the band composed their first soundtrack for the movie Maruf by Serdar Akar. In 2005 the band crerated music for Kutluğ Ataman’s movie titled İki Genç Kız which won them the best film music award by SİYAD in 2006. The soundtracks were collected into an album named Film Müzikleri which was released by Poztif in October 2006. The band took part in Fatih Akın’s documentary Crossing the Bridge. Pieces from their albums have also been used in various short and feature-length movies. We have been experiencing an extremely violent attempt to convert to a more totalitarian regime using all kinds of police forces, including civil gangs provoked by the prime minister himself. The word “more” is deliberately used above because the functionality of democracy in Turkey is a highly debatable topic since the inception of the republic. Open exchange and plurality is the last thing the current government wants because they cannot control the Turkish people in the same authoritarian way. Now the Gezi Park, where the protests began, functions as a symbol, yet this resistance is not solely an environmentalist effort, but an act against the oppressive regime of the prime minister and the ruling party. It is a fight to preserve the culture and history of this society, where people of different origin and belief live with respect to each other’s rights and freedom peacefully. The majority of the cultural acts are either cancelled or postponed. This movement has evoked a very powerful wave of artistic expression among the people of resistance. People have regained confidence and continue to develop collective wisdom which will be reflected in all forms of art as in music. Many anti-government and anti-violence songs came out during this crack down and we also never give up on writing music independently, encourage and support young musicians on being individuals. This is the largest and most effective public resistance which took place in Turkey and it still continues. It is hard to predict its long term impacts on our future work, but we believe it would be definitely positive, enlightening and connective, just like the movement itself.